On Sunday, August 16 a reported 112 civilians were killed, activists reported, after missiles from a Syrian military jet hit a public market at mid-day, with two strikes, one after rescue workers arrived. It's been described as one of the deadliest single jet strikes of the war, and widely blamed on the Syrian government. However, as usual, the details of this case are worth a closer look. There are various opposition-supplied lists of the victims cited around, but the fullest seems to be this updated list of 117 victims in the VDC martyrs database. Like the other lists, this shows a peculiar and obvious pattern; 109 of those who died are listed as adult men (the others being 5 boys and 3 women). This remains to be explained. Some suggest the dead are primarily rebel fighters killed in an airstrike somewhere else. But Monitor on Massacre Marketing (ACLOS-affiliated) suggests the men are likely kidnapped civilians the Islamist rebels executed. Just how widespread the damage was can be established somewhat from the visual record. Initial reports described an attack on a vegetable market and, as a later report said vaguely, the alleged airstrikes also hit "other residential areas during rush hour." 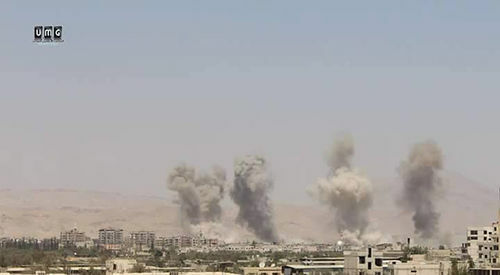 Ayman Abu Anas, a Local Coordination Committee founder, "told NBC News that around 9 missiles had hit the market and the wounded had overwhelmed local hospitals." Human Rights Watch heard there were four attacks that "hit the crowded markets, known locally as the al-Hal, al-Houboub, and al-Ghanam markets," all of which "are within 500 meters of one another." The inset photo, taken by opposition activists shortly after the attack, shows four distinct, high-rising plumes of smoke.
) a large steel-framed building that could be a market. Most of these are in a district labeled (on Wikimapia) for the SE thoroughfare Lane of Arabs ( حارة العرب ) Impact 4 is not clearly placed but deduced by the smoke plumes and pattern of the other three blasts - each 155 meters east-southeast of the last (describing a possible arc of attack), and with a video showing a strike on a building totally consistent with this one. The grisly post-attack scene shown in video MB1 is consistent with and probably is el-Hal market. The second market area (seen in video MD1) is park market. A photograph on Twitter shows this area from above, with a damage pattern suggesting a firing origin to the south. 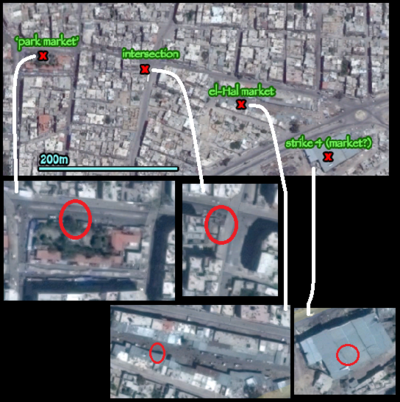 In the intersection attack, it seems some low-lying buildings were destroyed, perhaps the epicenter of damage (bottom image), but otherwise it seems no inhabited structures were seriously damaged. 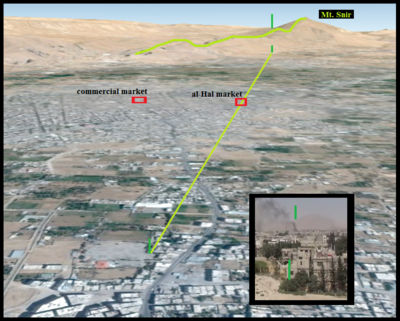 It seems likely these are the only four clustered areas that were hit at this time; as the top image shows, with a full view of Douma, no substantial smoke is rising from any other area, unless it's behind that plume, on the same blocked line of sight. It's in this limited area opposition sources claim 550 were injured, including 220 children, and 100+ men died along with 3 women and 5 boys (or similar - record refinement is in progress). The location of the gathered bodies of some 45 men and boys has also been decided. It's not a mosque but an Annatr school, formerly if not currently (here on Wikimapia). This lies 550 meters north of strikes 3 and 4, 700 meters from park market. The earlier views show at least 41 bodies of men and boys un-wrapped and then wrapped in the southeast dirt corner. Later afternoon views show at least 45 wrapped bodies ready for burial along the west wall. Man missing under rubble in Douma returns as ‘Living Martyr’ to his funeral The living martyr story has been widely reported. This article (Middle East Eye) has links to some of the sources. RT The Syrian government on Tuesday blasted UN special envoy for Syria Staffan de Mistura for his criticism of the Sunday air attack. It accused him of abandoning “impartiality” and stated that his remarks were "biased and based on the inaccurate information spread by Syria’s enemies." MD1 3:32 https://www.youtube.com/watch?v=lrlmC9jBtA0 Shows damage after some time, few if any casualties. Good general view of the area. It shows the worst of it happened a block or so away in a traffic intersection. This page was last edited on 5 December 2015, at 16:11.